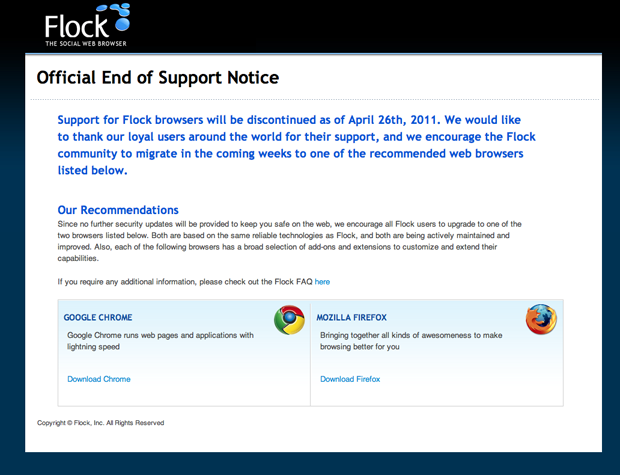 “Support for Flock browsers will be discontinued as of April 26th, 2011. We would like to thank our loyal users around the world for their support, and we encourage the Flock community to migrate in the coming weeks to one of the recommended web browsers listed below. Flock originated on the Mozilla platform but then switched over to Chromium in 2010. At its height it had 10 million users but then fell by the wayside just as the better funded RockMelt was emerging in the same super niche and perhaps unwarranted market. The team behind Flock was brought on to Zynga in January, in a talent acquisition that did not include the technology, the service or CEO Shawn Hardin. As Zynga never owned Flock.com, it had nothing to do with today’s shutdown.